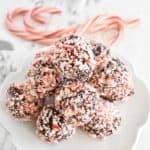 These festive little chocolate truffles are just waiting to be dropped in a mug of hot milk to create creamy and delicious peppermint mocha hot chocolate! In a small saucepan, combine all ingredients over low heat, stirring constantly with a heat-proof spatula. Heat and stir until completely combined and smooth. Pour into a freezer-safe container (I use a medium-sized glass bowl), cover and place in freezer to chill and set (at least 1 hour). Fill a small bowl with the candy you wish to roll the truffles in (or two separate bowls so you can do both) and set aside. Line a baking sheet with parchment paper. Use a small cookie scoop to divide out your truffles onto the lined baking sheet. Roll each truffle in desired coating, then place back on the lined baking sheet. Place finished truffles back in the freezer to set (at least 15 minutes). Either store all together in an airtight container in the freezer, or individually wrap each in plastic wrap before placing in the container. When ready to use, heat your milk of choice and carefully drop a truffle bomb into the glass. Stir to melt and combine, and enjoy!